The Good ~ These are very shimmery and light weight. The sparkle looks gorgeous on the lids. They do dry quickly. The doe foot applicator is perfect to get the color right where you want it. 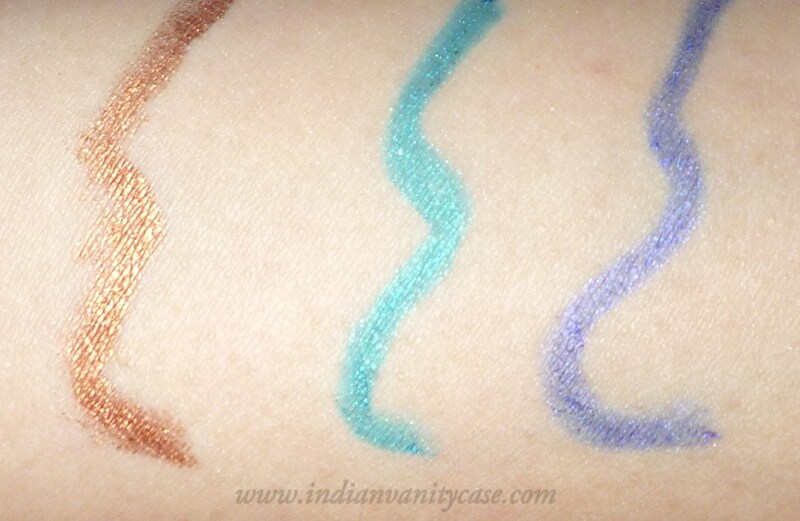 I love them because they give the same effect as pigments without the mess. 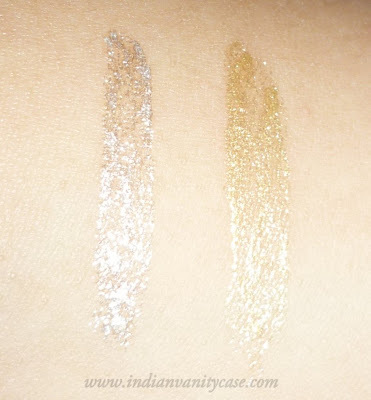 You can apply a little or more depending on how much shimmer you want. The Bad ~ I can't think of any. On the center of my lids, brow bone and inner corners of my eyes. I would also use the Silver one to highlight the top of my cheekbones and cupid's bow for a touch of glamour. 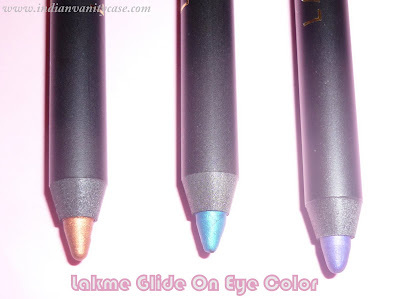 The Good ~ Very smooth eye pencils that glides on very easily. The best thing is these are smudge-proof! I must say that I like them better than the MAC Technakohl Liner. Smooth as kajal but do not smudge. Perfect! I honestly think both Eye Magic & Glide On Eye Color are great products to have from this collection. Decently priced too. Eye Magic ~ Black, Brown, Purple, Light Peach, Pale Pink. Glide On Eye Color ~ Black, Coffee Brown, Navy Blue, White. Can you review the lip artist? Lovely shades! Who doesn't love sparkly things? I got warm copper eye pencil from this collection.Its creamy and can be applied very easily...I used this as an eye-shadow too. But it stays only for 3-4 hours.Overall Im happy about the performance for this price. Want to know about the nail paints. I mean even colorbar has luscious shades for 90 bucks. 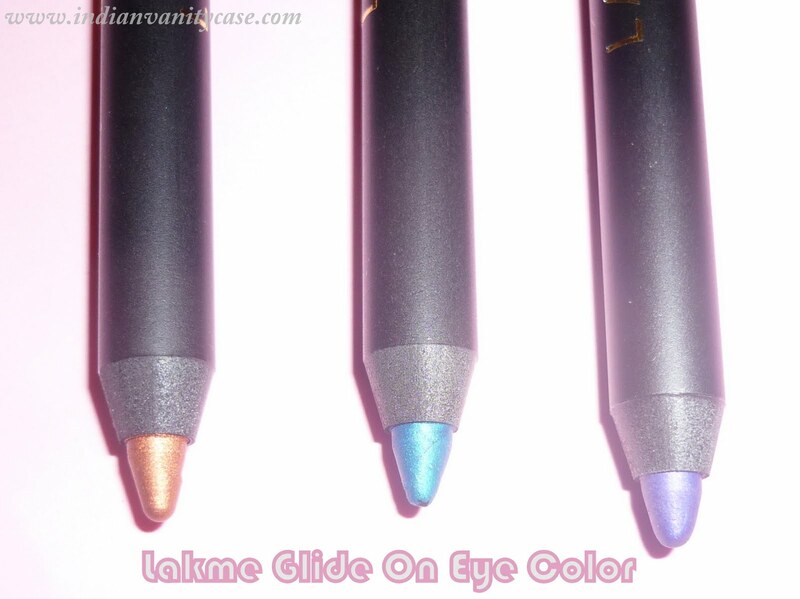 So is there any colour worth buying in the Lakme collection? the first thing that came to my mind when i saw plush purple was that it would look great on you! i have the aqua green and warm copper and love them both! these pencils are definitely better than the colorbar ones, which feel quite dry on my lids and pull them. :( do post looks using these pencils. review the new aquashines please? i hear the formula is different and i need your opinion. i need to check out the eye magic for myself. getting very mixed reactions on this one! the colours are oh so pretty. 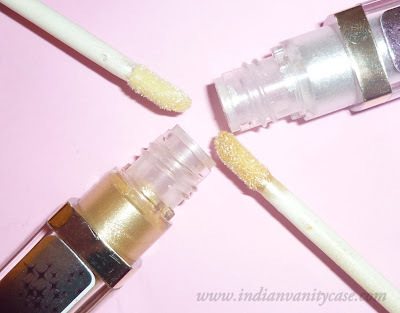 Hey Cynth can you write about the lip gloss pls..
Glide On Eye Color, saw them earlier on tanveer's blog and i loved the intensity of these pencils. i would love you do a look using these. better make a video. hii cynthia ..i wanted to ask that do you have any idea when will the mac scarlet ibis and maybelline 14hr lipsticks gonna be launched in Mumbai,India?? i asked at a mac store but they had no idea :( ...awaiting!